The Conference will take place in the resort of Albena on the Black Sea Coast, Bulgaria. Albena is a high-quality resort (known also as "Simply Heaven" ) with very reasonable prices. The resort offers in a relatively compact setting an array of dining, entertainment, and sports places, not to mention the cozy sand beach and the near forest reserve of Baltata. The compactness of the resort village of Albena allows satisfying diverse tastes and budgets, while still being able to communicate easily. We have secured special offers for the hotels listed bellow, which hold for the participants in AMiTaNS'18 as well as for the accompanying persons 3 days before opening and 3 days after closing the event. We hope that the wide array of prices and categories of these hotels will accommodate the different tastes and budgets of our participants. 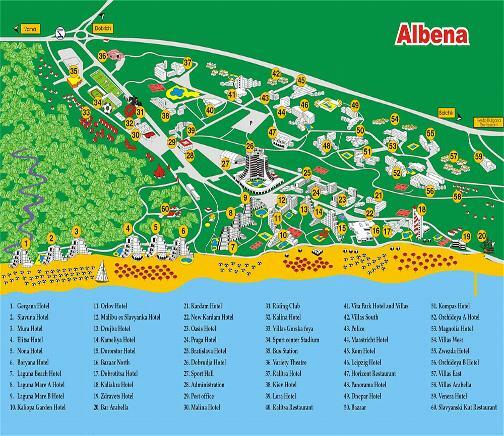 To get more preliminary information about above hotels please navigate through Albena. To book room, however, you should contact the Congress Department management submitting the provided here Reservation form. Just in case, please double the reservation by sending the text Reservation form to the e-mail kcenter@albena.bg. . When making the reservation by e-mail, you are kindly asked to identify yourselves as registered participants of the 10th AMiTaNS'18 conference. The customer representatives from the reservation center will confirm your accommodation and give you further directions. If you want to use the preferential prices you should do that not later than June 10th having in mind than after May 15th the hotel and room choice from the above list will be restricted. The direct on-line booking is also possible but is more expensive compared to the preferencial prices through the Congress Center. After this deadline has passed, you can still "shop" for accommodation in Albena, and will definitely find something suitable in a walking distance from the above mentioned three hotels/hubs of the conference. You can also find excellent accommodation in private rooms in the close village of Kranevo (3 km). Created on November 6, 2017.